BEWARE THE USUAL SPOILERS: Many of the themes developed in The Road Less Traveled return in Faith. But this episode is an even bigger melting pot of musical ideas from throughout the series. And it introduces the first brand-new theme since Cally’s theme in The Ties That Bind. The episode picks up right where we left off last week: a tense scene underscored with a signature percussion groove I called the Mutiny Riff. While this swinging 3/4 pattern rolls beneath the entire scene, the most interesting musical moment in the teaser happens while Kara and the crew are frantically treating Gaeta. Here, the ethnic soloists state a new idea which I will call Gaeta’s Theme for now. This theme will be featured (very prominently) in next week’s episode, so I will save the juicy details and analysis until then. But, it makes several appearances in this episode, foreshadowing the unusual role it plays next week. 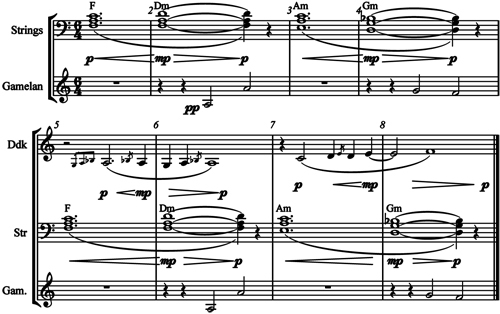 The first statement of Gaeta’s theme in the teaser is easily missed… since he’s screaming profanities in agony at the top of his lungs. 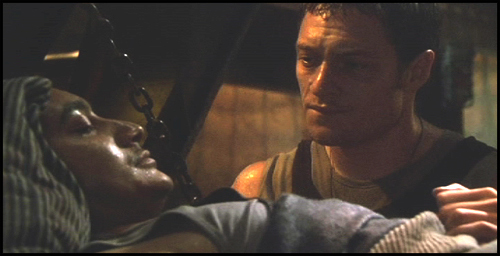 The first time you can really hear it is when Gaeta begs Helo not to allow Doc Cottle to cut off his leg. And it returns again later as Gaeta and the rest of the Demetrius crew anxiously await Kara’s return. The rest of the Faith score is constructed from a wide array of themes from throughout the series. The Starbuck Destiny theme returns from last week, continuing to underscore Leoben and Kara. A lush and beautiful arrangements of this theme can be heard as Kara guides the raptor toward the gas giant, leading to the reveal that the basestar was the comet in her vision. The signature solo erhu brings the Destiny theme back again as Kara listens to the hybrid, attempting to find meaning in the seemingly random string of words. The music sneaks in, almost taunting her. She can feel that there’s something of great importance being spoken to her, but simply can’t make sense of it yet. The hybrid’s scream as she is unplugged is a cacophonous and trippy musical moment. Her voice blends with searing voices in the score and sound design, including an arsenal of bells, chimes and temple bowls of all sizes. This is the same group of instruments I used to represent the Temple of Five in The Eye of Jupiter. This marks the first time this theme has been heard since the end of Maelstrom. I like using the Temple of Five theme to suggest that Kara’s destiny, the Final Five and the hybrid’s prophecies are all related somehow. And the Kara Destiny theme returns in full force when the hybrid drops the “harbinger of death” bomb on her. I love this moment because the Destiny theme has always represented mystery and hope. Here, it is used in ironic contrast. As Starbuck grapples with the idea that her destiny is not to the benefit of mankind, the Destiny Theme suggests that the audience look back at her entire journey with a revisionist eye. Perhaps she’s not the savior we’re hoping her to be. Originally one of the most frequently heard melodies on the show, this gamelan melody was slowly relegated to the background throughout Season Two and Three. A brief appearance in The Ties That Bind was the only previous usage of Boomer’s Theme thus far in Season Four. There were many factors that lead to this theme’s relative disappearance. First and foremost, Boomer’s character splintered into multiple copies of her model by the end of the first season, each with a distinct personality. Her various versions were defined by her relationships with other characters around her: Tyrol, Hera, Helo, and Adama (among others), all of whom had their own themes already. As a result, I never bothered writing an “Athena Theme,” unique from the “Boomer Theme,” or “Another Copy of Sharon Theme.” That approach would be way too confusing. One theme for all had to suffice. In Faith, Athena (Good Sharon) is confronted with multiple copies of herself (Helpless Sharons) who are in trouble because the original Boomer (Bad Sharon) sided with Cavil and caused a civil war. All the disparate Sharon copies are coming back to face one another, introducing an idea that will be developed further in the second half of the season. So, it provided the perfect opportunity to bring back the Boomer theme, which can be heard prominently in three key sequences. When Athena arrives at the basestar and is confronted by a squadron of Sharons, the cue begins with a spooky and unsettling tone. Here, the Boomer theme represents Athena’s disgust and disappointment in… well, herselves. 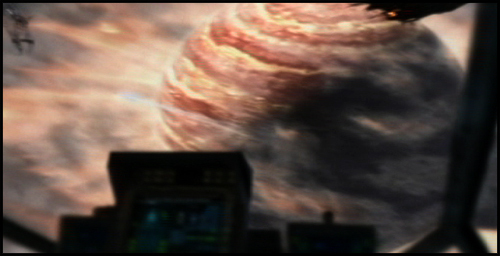 The last use of the theme occurs at the climax of the show, when the basestar jumps back to Demetrius in the nick of time. Athena contacts Helo via the wireless and a resolved version of the Boomer Theme assures us that everything is going to be okay. And of course, the Final Four theme returns yet again. You’ve probably noticed this theme has become one of the signature musical ideas of Season Four. This trend will continue to unprecedented results in the second half of the season that are very likely to blow your minds. It’s featured several times in Faith, but none as prominently as the moment after Kara and the Cylons decipher the hybrid’s prophecy. Everyone else in the scene is excited by the possibility of unboxing D’Anna and finding Earth and leave the room with a sense of urgency. But Anders stays behind with the dead Sharon. The only thought on his mind is that D’Anna could identify him. The statement of the Final Four theme ignores the urgency and excitement of the rest of the scene and echoes only his paranoia and dread. 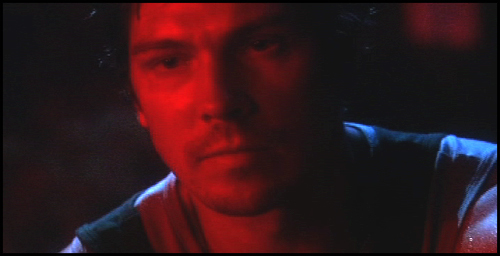 The scene where Anders holds a gun to the head of a Six after she killed Barolay was a difficult moment to score. Number Six obviously has a theme, but it would have been totally out of place in this context. After all, this wasn’t Head Six, or Caprica Six, or Gina, or even Natalie… this was an unknown Six copy, whom we’ve never met before and obviously won’t again. So, rather than scoring her character I decided to score her arc. Much of the first season was scored with this approach. In fact, I never set out to write character themes at all. Certain story arcs were given specific themes, and over time they gradually evolved into signature character themes, such as the Starbuck Theme, Adama Theme or Boomer Theme. At the time, I referred to this as Duck’s Theme, since it was composed for the scene on the pyramid field when he volunteers to go on a suicide mission. The only other time it’s heard is as Duck looks in the mirror, thinking of his family, before leaving to blow himself up for his cause. Duck is obviously not a major character on the show. In fact, if you even remember who I’m talking about, you know you’re a serious Galactica fan. However, his scenes were intensely powerful and wonderfully summed up the whole, frakked up, misguided mess of good intentions that was New Caprica. Each side wanted to do the right thing, and continued to make wrong choices. This brings us back to Faith. When Six killed Barolay, it re-opened this wound and brought to the surface old grudges and bitter emotions. I wanted the music to help underline the connection between the events happening on screen and the storyline from over twenty episodes ago that caused them. Thus far, I’ve mentioned nothing about the episode’s most memorable sequences. Faith features many scenes of Roslin’s bedside conversations with a dying cancer patient named Emily. But, I didn’t comment on their arc with any music whatsoever. The unsettling atmosphere of ambient hospital sounds, nurses walking past, the pulse-like beep of the monitoring equipment, and the eerie silence that filled the pauses of their conversation, provided the scenes with a disturbing sense of reality. Speaking of Roslin, Faith ends with one of my favorite scenes between her and Adama. 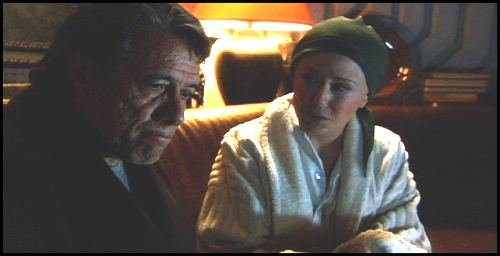 Adama confesses that Roslin has made him a believer and they share a tender moment, despite the episode’s dark circumstances. It is underscored with their theme, performed as always by violinist Paul Cartwright. Their relationship has developed considerably over the past 6 episodes, and I am thrilled to have had so many opportunities to slip this theme into the sonic texture. In a few episodes, you’ll hear an even better full arrangement of it. And isn’t it nice to have an episode end on a happy note once in a while?